Fethullah Gulen, a reclusive religious cleric who lives in a gated farming community in Pennsylvania, has been placed on Turkey's most-wanted terrorist list, along with leaders of the Islamic State militant group -- also known as ISIS -- and Kurdish and left-wing guerillas, various media outlets reported Thursday. The Turkish government has charged the aging preacher, who is known globally for his emphasis on pluralism and interfaith relations, with attempting a coup against the ruling party. The wanted list included some 728 names and ranked them in five color-coded categories. Gulen, 74, was listed in red, denoting him as a high-risk. Gulen’s movement includes thousands of schools and businesses across the world, including some of Turkey’s most well-known media outlets and one of its biggest banks, which suffered last year as state-owned firms and institutions withdrew massive deposits. The bank was seized by authorities in May. Gulen is accused of wielding power in the country’s judiciary and police force to open a massive fraud probe into the ruling AK Party in late 2013. Government officials responded to leaked tapes, which tied high-ranking government officials -- including the president’s family -- to corruption, by accusing supporters of Gulen with attempting to destabilize the democratically elected government. They launched a massive crackdown to purge Gulen's influence from state institutions and vowed to destroy his businesses. Critics of the ruling party have charged the country’s president, Recep Tayyip Erdogan, of scapegoating Gulen’s movement to deflect criticism from his own government and reshuffle the country's judiciary. The same day the list was released, authorities placed a media holding company linked to Gulen under the management of a government-appointed trustee, pending investigation into financial links with Gulen’s movement. Images and videos showed massive crowds protesting outside media offices tied to the holding company in Istanbul as police led away handcuffed journalists. Gulen and Erdogan were once allies against the country's secular elite, which held a tight grip on state institutions and repressed their opposition. In the late 1990s, Gulen left for the U.S., citing medical treatment. But instead, he set up a gated community in the Pocono Mountains, where he has lived in self-imposed exile since. His supposed links in places of power were considered helpful in Erdogan’s election as prime minister in 2002, but the two gradually adopted divergent views for the country’s future. Gulen's supporters deny any manipulative power in the country's judiciary or police forces. 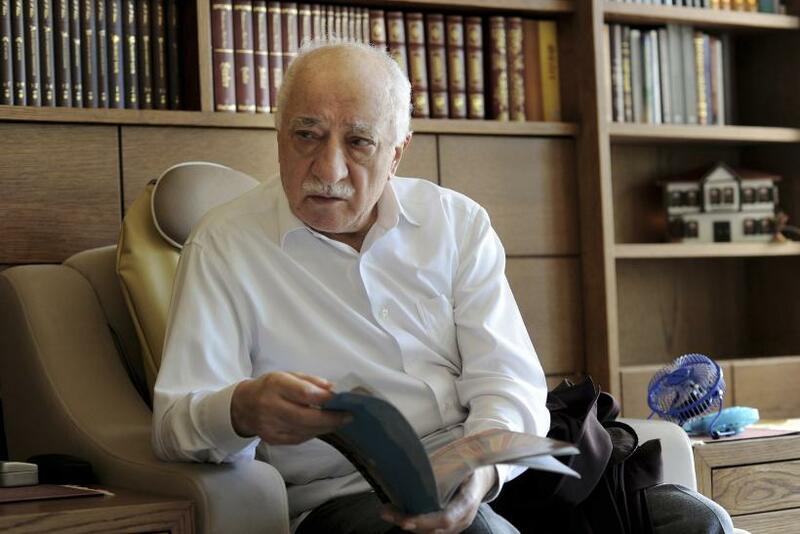 Earlier this month, a Turkish prosecutor sought a life sentence for Gulen on charges that ranged from espionage to funding and managing armed gangs. The Turkish government seeks Gulen’s extradition from the U.S.